I’ll never forget the Iraqi student who became terrified when he discovered the car he was riding in was inadvertantly passing by Amman’s Iraqi embassy. He insisted Saddam’s mukhabaraht was hanging around the embassy and would recognize him and come after him. As the car passed by the building, he tried to sink down in his seat so as not to be visible. Maybe it was true. Back in 1999 there were plenty of Iraqis in Amman with stories about their relatives being killed by Saddam. Richard Nixon was certainly a divisive figure in American politics. But when he died, the man who he had defeated for the presidency, South Dakota Senator George McGovern, was the first to put aside the Watergate fiasco and remember that Nixon opened diplomatic relations with China. In the same way, Chicago gangster Al Capone was no doubt was responsible for innumerable gangland killings. Today he is remembered in his home suburb of Cicero as a man who kept the streets safe for children. Adults remember how when they were children during the depression they would line up every weekend by the movie theater. Capone’s car would pull up and he would pay the nickel admission for all the children. “You have known your brother and leader very well and he never bowed to the despots and, in accordance with the wishes of those who loved him, remained a sword and a banner. “This is how you want your brother, son or leader to be… and those who will lead you (in the future) should have the same qualifications. This is how Saddam saw himself as a leader. Not compromising or engaging in diplomacy, but doing battle and being contentious. Not exercising guidence and leadership, but being swept up by the Arab street as a symbol for the mob. This was the old style Arab leader in the mold of Egypt’s Nasser, Palestine’s Haj Amin, or even Jordan’s King Hussein who frequently visited Saddam on vacation hunting trips. Someone who was larger than life and could be a symbol of the emotional ferver of the nation. But Saddam was wrong when he said the leaders of the future need to be in the same mold. The new leaders will have to understand tribal politics, but also global politics. They will have to understand not just how to stay in power, but how to maintain economic stablity in the region. In Saddam’s 8-year war against Iran, some 1.7 million died on both sides, and Iraq was left with a war debt of $75 billion. Some $30 billion of that war debt was owed to Kuwait. In the subsequant war against Kuwait, an estimated 20,000 to 100,000 more Iraqis died. Does Iraq need more bloodshed and saber-rattling, or do they need someone in the CEO mold of Jordan’s King Abdullah, who seems to understand global economics enough to negotiate successfully with the IMF. No, this is the 21st century. Let’s hope Saddam was the last dinosaur of an era. “In the past, I was, as you all know, in the battlefield of jihad and struggle. “God, exalted by He, wished that I face the same again in the same manner and the same spirit in which we were before the revolution but with a problem that is greater and harsher. “Oh beloved, this harsh situation, which we and our great Iraq are facing, is a new lesson and a new trial for the people by which to be judged, each depending on their intention, so that it becomes an identifier before God and the people in the present and after our current situation becomes a glorious history. “It is, above all, the foundation upon which the success of the future phases of history can be built. “In this situation and in no other, the veritable are the honest and faithful and the opposing are the false. “When the insignificant people use the power given to them by the foreigners to oppress their own people, they are but worthless and lowly. In our country only good must result from what we are experiencing. “To the great nation, to the people of our country, and humanity: Many of you have known the writer of this letter to be faithful, honest, caring for others, wise, of sound judgement, just, decisive, careful with the wealth of the people and the state… and that his heart is big enough to embrace all without discrimination. “His heart aches for the poor and he does not rest until he helps in improving their condition and attends to their needs. “His heart contains all his people and his nation, and he craves to be honest and faithful without differentiating between his people except on the basis of their efforts, efficiency, and patriotism. “Here I am speaking today in your name and for your eyes and the eyes of our nation and the eyes of the just, the people of the truth, wherever their banner is hoisted. “Here, I offer my soul to God as a sacrifice, and if He wants, He will send it to heaven with the martyrs, or, He will postpone that… so let us be patient and depend on Him against the unjust nations. “In spite of all the difficulties and the storms which we and Iraq had to face, before and after the revolution, God the Almighty did not want death for Saddam Hussein. “But if He wants it this time, it (Saddam’s life) is His creation. He created it and He protected it until now. “Thus, by its martyrdom, He will be bringing glory to a faithful soul, for there were souls that were younger than Saddam Hussein that had departed and had taken this path before him. If He wants it martyred, we thank Him and offer Him gratitude, before and after. “The enemies of your country, the invaders and the Persians, found that your unity stands as a barrier between them and your enslavement. “They planted and grounded their hateful old and new wedge between you. “The strangers who are carrying the Iraqi citizenship, whose hearts are empty or filled with the hatred that was planted in them by Iran, responded to it, but how wrong they were to think that they could divide the noble among our people, weaken your determination, and fill the hearts of the sons of the nation with hatred against each other, instead of against their true enemies that will lead them in one direction to fight under the banner of God is great: The great flag of the people and the nation. He then adds a further note: “I have written this letter because the lawyers told me that the so-called criminal court – established and named by the invaders – will allow the so-called defendants the chance for a last word. “But that court and its chief judge did not give us the chance to say a word, and issued its verdict without explanation and read out the sentence – dictated by the invaders – without presenting the evidence. Can a sign in a bus bridge a cultural gap? We’ll see. Signs in Arabic have started sprouting up in the city of Richmond, Virgina. They’re part of a campaign by the Virginia Interfaith Center to fight fear. The campaign has sparked a public dialogue, but not all of the reaction has been positive. For example, this is one fear-based T-shirt you will NOT see offered here. I’m not even going to post the link to this one. But I will post a link to the Virginia Interfaith Center. You can read some comments from the public about their signs and for ten dollars you can sponsor a sign on a Richmond bus. Some of my best memories of Jordan are of sitting huddled around a kerosene heater with the librarian and a few other teachers in a small village school library, listening to a tape of “al-Layla Dobe,” squeezing a green lemon over a shared can of tuna, and toasting pita bread over the top of the soba. The main office where the mudira sat had a second larger upright propane heater on wheels, but the school’s classrooms were totally without heat, and birds flew in and out of the classrooms. (A bird in the classroom is lucky, I was told as I ducked the swooping creature, the sign of a safe place, since birds will not go where there is danger.) On the coldest days, many parents kept the smallest children home from school for weeks at a time. The snow and heavy precipitations we were praying for and were finally granted brought to the fore deficiencies that qualify as inexcusable. One is lack of any heating system in public schools. King Abdullah had graciously ordered that heating units be made available to these schools so that students can cope with the near zero temperatures in classrooms. Since this year’s cold weather is not exactly unique, and the winter season is normally severe across the Kingdom, the question concerned authorities might want to answer is why schools have no heating systems until now. Do they believe that keeping warm in the winter is a luxury that students can and should do without? Is there always need for the King to intervene before action is taken to solve problems which common sense should take care of? The short answer to the editor’s question is “yes.” For some reason government officials are unwilling to act and routinely defer any and all decision-making to the next higher level of government. At the same time, any grass-roots activity–like a teacher-parent organization–is completely lacking. This is a common pattern across the Arab world. I have never been able to figure out why. According to the Jordan Times, Wednesday’s snows closed off the desert highway, stranding travelers in the areas of Maan and Petra, and on the road between Petra and Aqaba. Jerusalem’s Old City also got an uncharacteristic snowfall. But did Amman get snow? As the new chairman of the Senate Foreign Relations Committee, and a candidate for president, Senator Biden has shown a great interest in Iraq. His plan for Iraq has been well publicized and now those of us who somehow got on his mailing list have received a new missive about Iraq. Briefly explained, Biden is against increasing troop levels. I once tried to figure out how many troops were in Iraq and how many deaths per thousand per day there were. There are some numbers online, but I quickly gave up, concluding that the movement of troops in and out of the region is a shell game. While public announcements are made about troops arriving or troops departing, no one in the public can really tell whether the net troop size is increasing of decreasing. So if Bush wanted to surge the troops, perhaps in anticipation of the execution of Saddam Hussein, which may already have taken place, he has probably already done so without public knowlege. As President Bush prepares to announce a new strategy for Iraq, one idea has emerged as his leading option: to surge more troops into Baghdad in a last ditch effort to stabilize the city. There is one big problem with that option: in the absence of a political settlement among Shiites, Sunnis and Kurds, it will not work. We’ve tried the military surge option before and it failed. If we try it again, it will fail again. And surging our forces in Baghdad risks terrible consequences: more American lives lost and more unbearable strain on our military for no strategic gain. If the President proposes escalation in Iraq, I will oppose him and so will many of my colleagues in Congress. In January, I intend to hold a series of hearings in the Senate Foreign Relations Committee on Iraq. I have already invited Secretary of State Rice to testify. It is my hope that these hearings will generate a bipartisan consensus around the best way to move forward in Iraq and convince the President that “surging” additional forces into Baghdad is not the answer. I will send further updates about these hearings and the situation in Iraq soon. Until then, I wish you a safe and happy New Year. It is being reported that Saddam Hussein has been transferred to Iraqi custody and may be executed Saturday, which could be as early as midnight tonight, U.S. time. How lucky we are in America to have an orderly transfer of power in our government. All we do is vote, and a new scoundrel comes in to replace the old scoundrel, while the old scoundrel retires with a nice pension. Is killing Saddam Hussein the only way to remove him from his position of power so that he never comes back? Posted in Iraq, Middle East. Comments Off on Is Saddam Alive? Iraq’s highest court has rejected an appeal of Saddam Hussein’s death sentence. Iraqi sources say Saddam will be turned over to Iraqi authorities on the day of his execution. Saddam Hussein’s lawyer warned Thursday of more bloodshed if Saddam is turned over to the Iraqi authorities. “If the American administration insists in handing the president to the Iraqis, it would commit a great strategic mistake which would lead to the escalation of the violence in Iraq and the eruption of a destructive civil war,” al-Dulaimi told The Associated Press in a telephone interview. Also Thursday, 30 Iraqi civilians and 5 American soldiers died in shootings and bombings. The bodies of 42 Iraqis who had been tortured were found dumped in Baghdad. Violence and bloodshed. And exactly how will that be different? Waiting for Snow in Amman–Global Warming in Jordan Too? 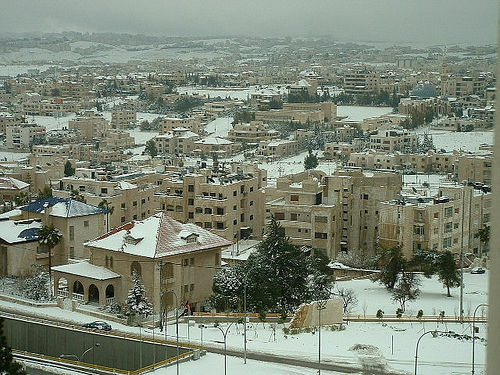 Thanks to Firas in Jordan for this photo of a snow-dusted Amman. Firas, who writes a blog at http://iheartamman.blogspot.com/, has been predicting snow for Christmas, but alas! he has had to revise his prediction to rain–only the higher altitudes can expect snow. I suppose that means the ususal snowstorm north of Amman in the hills and forests of Ajloun (for Bible readers, that’s in Gilead) with a few flakes reaching as far northeast as my old hometown of Jerash. Waiting for rain in December? I thought Jordan’s rainy season started in October. Firas’ comment? His predictions make Fox News look credible! I guess they know about Fox News out in Jordan too. Posted in Jordan, Middle East. Comments Off on Waiting for Snow in Amman–Global Warming in Jordan Too?